Looking for a way to light small projects with LEDs? 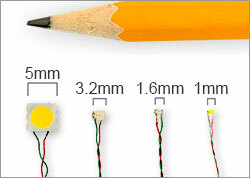 These tiny LEDs have thin and flexible wires that allow them to fit into very tight spaces. They are perfect for lighting small projects! LEDs are much brighter, stay cool, and have a much longer lifetime than filament bulbs.The LEDs may be powered with batteries or wall adapters. Customers use these small LEDs for all types of projects including: dollhouses, displays, roomboxes, model railroading, book art, costuming, dioramas, sculptures, mixed media art collages, etc. Additional accessories are available for extending the length of the wires and hiding the battery holder. Check out our tutorial on using these 3V LEDs.